Two (or more) minds are better than one. 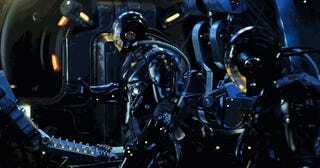 In Pacific Rim, Jaegers are more efficiently controlled when two or more minds are melded via 'The Drift'. Running on this idea, Jeremy Hsu at ieeespectrum, discusses real world scientific research in combining the electroencephalogram (EEG) signals used in brain-computer interfaces (BCI). Now generally, the EEG signals can be noisy and require processing to achieve useful signals. In addition, depending on the intended brain waves required, a user has to learn how to generate and maintain those waveforms- a task which requires focus. Jeremy points out two papers which demonstrate the benefits of merging EEG signals from multiple participants in an effort to output clearer and more consistent signals.